Stephanie at Somewhat Simple has this tutorial posted on her blog. 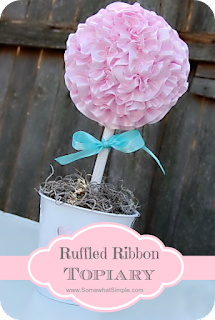 While she has it posted as a Valentine Topiary, I can see making this in your favorite colors throughout the year, Mother's Day, Easter, Christmas, and even give as a birthday gift, baby shower or wedding centerpieces. Oooh, how about a few at different heights and in a larger container? For the tutorial and material list, simply click on the photo above.